April 04, 2019: KAR Result 2019 - The Karnataka Secondary Education Examination Board (KSEEB), which came in to existence in 1966, has been conducting the Karnataka SSLC Examination (Class 10 Examination) every year and declaring the Karnataka SSLC Results successfully over the years. For every academic year about 9 Lakhs students appear for the Karnataka SSLC Examinations. The Karnataka SSLC Results 2019 is expected to be declared in May, 2019 on this website along with SMS - 56263. The Karnataka SSLC Result, KSEEB SSLC Result, Karnataka SSLC Results 2019, KSEEB Results 2019 will be announced here along with SMS - 56263. The Karnataka Secondary Education Examination Board (KSEEB) conducts the Class 10 examinations every year during the month of March. This year, it will be conducted from 21 March to 4 April, 2019. Keep checking the website for further details on Karnataka 10th result 2019, and Karnataka SSLC exam Time Table 2019. 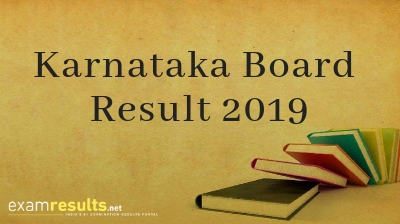 The Karnataka board is expected to announce the Karnataka second PUC result 2019, Karnataka Second PUE Results, Karnataka II PU Results, Karnataka PU Supplementary Result in last week of April or first week of May on examresults.net. The Department of Pre-University Education (PUE) deals with the First Year and Second Year Pre-University Examinations (Class 11 and Class 12 Examinations). Pre-University Education (PUE) is a link between Secondary Education and Higher Education. About 7 Lakhs students appear for Karnataka PUC Examinations every year. This year the Karnataka PUC exams are being held from 1-18 March, 2019. Keep checking the website for further details on Karnataka PUC examination results 2019, and Karnataka Board second PUC Time Table 2019. How to Check Karnataka SSLC Results/Karnataka PUC Result 2019? The Karnataka Board PUC Pre University Board Examination Results in the year 2016, were declared on 25 may for class 10th and 12th both while in 2017, the Karnataka Board exam results for class 10 were declared on 13 May and for class 12, it was declared on 11 May. Last year, Karnataka PUC Pre University Board Examination Results was declared on 30th April at 12 Noon and the SSLC Karnataka Results was declared on 7th May 2018 at 11 AM. Where Else To Check KSEEB Exam Result 2019? Karnataka Secondary Education Examination Board which came into existence in the year 1966 has been conducting SSLC, PUC and other examinations. The board regulates and supervises the system of Secondary education in Karnataka State. It executes and governs various activities that include devising of courses of study, prescribing syllabus, conducting examinations, granting recognitions to schools and, providing direction, support and leadership for all secondary educational institutions under its jurisdiction.